This is one of those images that could have really benefitted from a wide angle lens. As it is it is still very good with strong composition and great detail. Angling the image was a good idea. Not a vantage point for the acrophobic. :-) Great perspective, a real eye catcher! Great 'from above' shot-- might benefit from increased saturation to create a more striking scene. nice photo really good angle. I'd be right smack in the middle and take the picture like that! Hoover is something like 700 feet tall right?! Great shot! Neat perspective, makes me dizzy! needs a little light to create more intrest. Really great shot. Superb idea, well executed. One of my more favourite photos this week. 8. I'm not lsure about the angle at all. Whoa! I'm getting a little queasy just looking at this! Very cool vantage point -- well done! 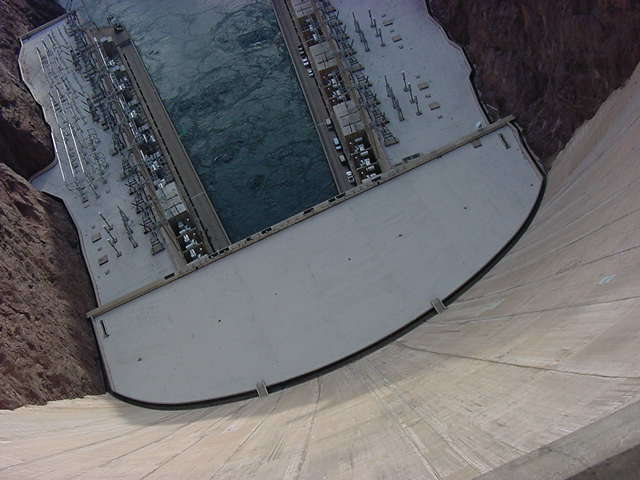 Even though I would like to see more of the dam, and the lower facilities are cut off, I still was struck by the distance and the impression of height. Proudly hosted by Sargasso Networks. Current Server Time: 04/22/2019 12:54:10 AM EDT.